The Indigo Dottyback (Pseudochromis fridmani x sankeyi) is a beautiful hybrid fish that, like other dottybacks, will surely become the center of attention in almost any tank. It is a captive-bred hybrid cross between the Orchid Dottyback and the Striped Dottyback. As with other dottybacks, the Indigo will likely be seen swimming amongst the rocks, looking for both food and new hiding places. Distribution: Though both the Orchid and Striped Dottybacks are found in the Red Sea, the Indigo Dottyback is not known to exist in the wild. Physical: Being a hybrid of the Orchid and Striped Dottyback, the Indigo has characteristics of both fish, but also has features unique to itself. The most unique feature is the indigo-colored body, though some fish may be a lighter blue or darker purple. Many share both colors, and almost seem to change color depending on the angle. Like the Orchid Dottyback, they have a vertical black bar that runs from their nose, through their eye and stops at their gills. Then, like the Striped Dottyback, most Indigos have a black stripe that runs the entire length of their body. Temperament: Indigo Dottybacks tend to be a more peaceful and docile fish, similar to the Striped Dottyback, which is typically found living in colonies in the wild. Caution should be taken when adding multiple dottybacks by providing them with lots of hiding places and adding them all at the same time. This will allow them to find their own shelter and prevent disputes over territory. Size: The Indigo Dottyback will grow up to 3” in length. 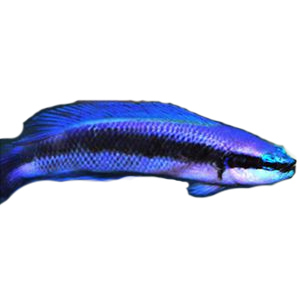 Diet: Indigo Dottybacks are carnivorous, and should readily accept most meaty foods, such as brine shrimp, mysid shrimp, or other prepared foods. 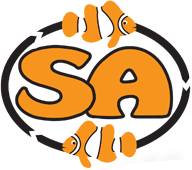 They also respond very well to most pelleted foods, such as SA’s “Hatchery Diet”, which helps provide them with a more balanced diet for continued growth and vibrant coloration.